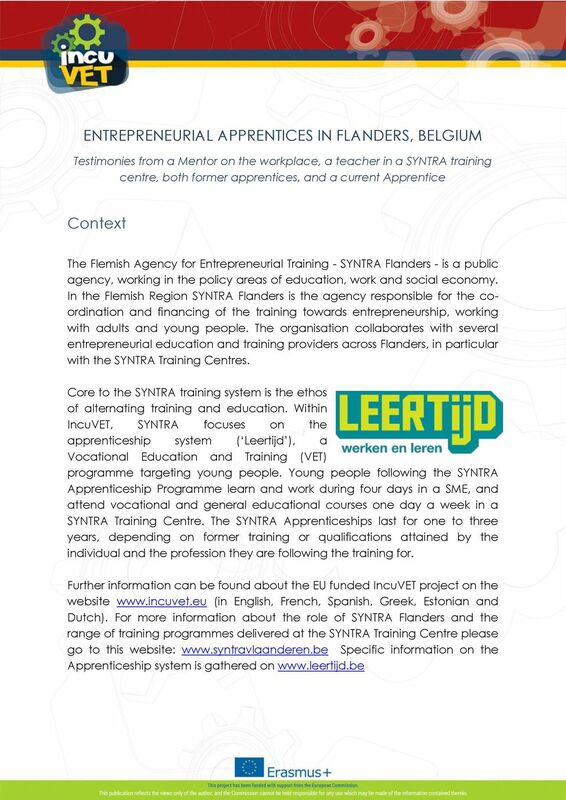 Download "ENTREPRENEURIAL APPRENTICES IN FLANDERS, BELGIUM"
2 An insight from two former SYNTRA apprentices This Case Study presents the experiences and testimonies of two men who were former apprentices; and are now working for the SYNTRA network supporting young apprentices learning their profession within the SYNTRA dual system of working and learning. Dirk Smet (at the right) was an apprentice roofer and is now a Supervisor within a roofing company in Sint-Niklaas and mentoring Jordy Poltyn, a current apprentice roofer with SYNTRA. Dirk Aerts was an apprentice in information technology and computers, and currently manages three computer shops; in which apprentices are trained. He also works 8 hours a week as a Vocational Trainer in SYNTRA Genk for the current apprentices on the PC Technician programme. In addition, he trains the new mentors in the SYNTRA-network in the Estafette Programme. Thinking back to your time being an apprentice, can you tell me first why you decided to do an apprenticeship with SYNTRA? Dirk Aerts: At schooi I didn t really do anything much; sometimes I skipped school and did odd jobs to gain money. I didn t have a goal, and it seemed that I had a few problems across the board; but I wasn t lazy and I did want to work. From the first day I started at SYNTRA I knew this was the right choice. I was working four days a week, learning the business out in the field. I had a goal, I wasn t in a classroom every day; instead I was learning the profession in a realtime environment in a good way. 3 Dirk Smet: Twenty years ago, when I was 14, I told my parents I wanted to work with wood; I ve always loved wood and making things. I was sick of normal school; it was as if I had too much energy to sit in a classroom and learn a load of things that didn t seem relevant to me. I wanted to work and earn money. I started on the Apprenticeship programme, and although the first placement didn t suit me I didn t just give up; instead, supported by SYNTRA, I found the perfect place to train and work. What kind of things did you learn when you were an apprentice in the SYNTRA classroom? Dirk Aerts: I learnt a range of different competencies: for example team work, individual motivation, goal setting, how to work with colleagues, and problem solving; all things that are real and useful when you are working. I also understood things like the need to obey rules; as a student sometimes you are out of your comfort zone, but you needed to learn to develop skills and learn about general knowledge topics or basically can t graduate. How do you think you benefitted from being on the work placement when you were on the apprenticeship? Dirk Aerts: When you are an apprentice the employer has to pay you, so if you want to do well you have to listen and learn and be able to work on your own. Having a positive work attitude is one of the most valuable things to have. The boss taught softer skills, as well as the trade skills. How far you go on your apprenticeship depends a bit on the attitude of the apprentice, but if you are willing to listen you can pick up this information, and my boss stimulated this. Dirk Smet: The Apprenticeship Pathway Counsellor found the work placement for me; the first one wasn t right, I just cleaned the floor and collected materials. So then I changed placement, and it was good from the start. I had a great boss; he taught me the job and I learnt so many things; and when he saw that I could get on with it and do a good job he would pay the extra hours I worked. I started making windows, learnt to install them, and then I moved on to roof construction. 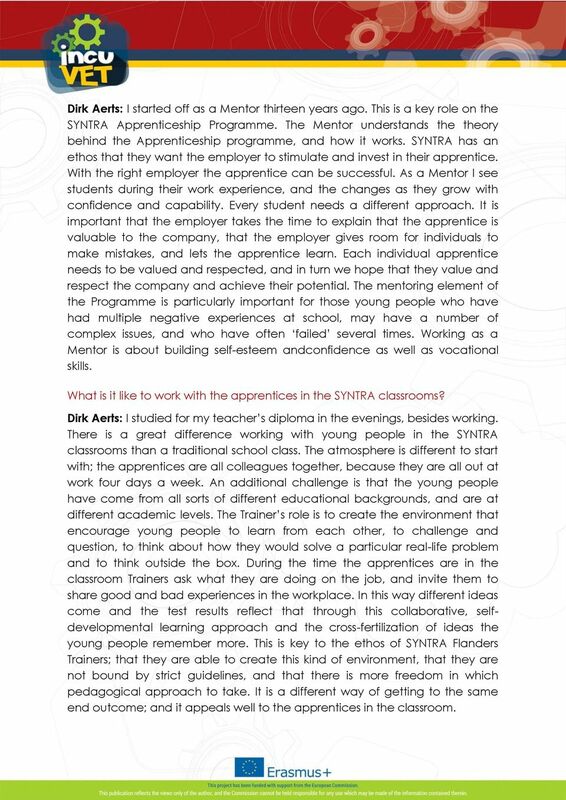 4 In what ways did the SYNTRA Apprenticeship Training help you? Dirk Aerts: When you have finished the time with SYNTRA you already have three years of working experience; and I learnt a lot more than I would have done at school, both the theory and the practice. This means you bring better experience for a company and the employer, especially smaller companies. The computer company where I did my apprenticeship was able to employ me when the SYNTRA Programme finished. There are now three computer shops; and the boss has taken on about twenty apprentices in total after their apprenticeship with the company has finished. Dirk Smet: The company that I did my apprenticeship with could not afford to keep me; so I went to a larger company. I ve found that 90% of time I go for a job I get it because I have the experience. During my time as an apprentice I gained self-esteem; I learnt how to organise my own life, how to follow my own ambition, and use my skills to the maximum. What made you decide that you wanted to work with SYNTRA to support the current apprentices? Dirk Aerts: We both knew from our own experiences about the big difference having an apprenticeship with SYNTRA can make for a young person. The graduation rate is over 90%; no other education or training opportunity has such a high graduation level. This is why we wanted to be a part of it. During the years I was working I kept in contact with SYNTRA. They don t only do the apprenticeship training, but offer opportunities for people working to follow other programmes, which support Continuing Professional Development. I wanted to continually improve; it s part of my goal, and I have a lot of personal ambition. I then saw ways that I could be involved myself with the SYNTRA training network. What roles are you now doing with SYNTRA Flanders, in addition to your day to day work? Dirk Smet: It is part of the role of an employer to look at how the apprentice is reacting. My boss has become too busy to work closely with the apprentices; so he has asked me to take on the role of the Mentor. Jordy is an apprentice on the SYNTRA Programme; I could see that he is good, could benefit from positive mentoring, and I believe he has a future in this industry. As well as teaching Jordy technical skills, I am also trying to show him different technical approaches and how to be a smart worker. 5 Dirk Aerts: I started off as a Mentor thirteen years ago. This is a key role on the SYNTRA Apprenticeship Programme. 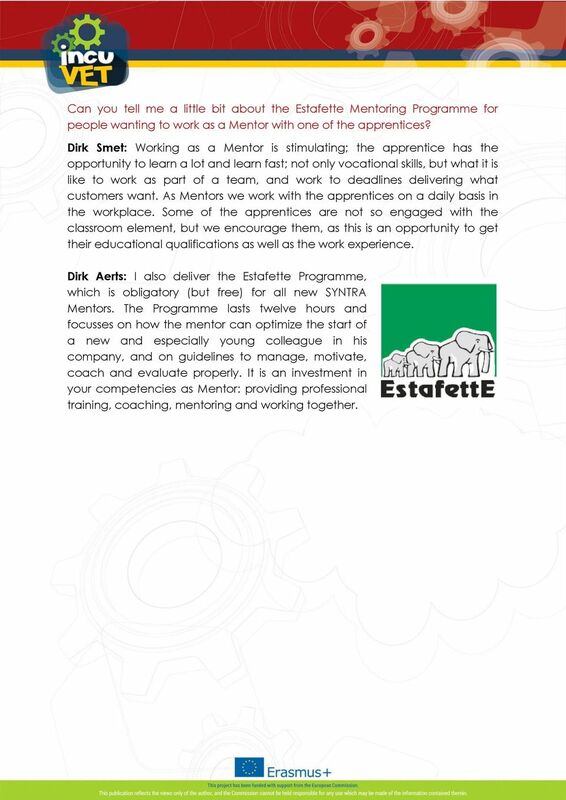 The Mentor understands the theory behind the Apprenticeship programme, and how it works. SYNTRA has an ethos that they want the employer to stimulate and invest in their apprentice. With the right employer the apprentice can be successful. As a Mentor I see students during their work experience, and the changes as they grow with confidence and capability. Every student needs a different approach. It is important that the employer takes the time to explain that the apprentice is valuable to the company, that the employer gives room for individuals to make mistakes, and lets the apprentice learn. Each individual apprentice needs to be valued and respected, and in turn we hope that they value and respect the company and achieve their potential. The mentoring element of the Programme is particularly important for those young people who have had multiple negative experiences at school, may have a number of complex issues, and who have often failed several times. Working as a Mentor is about building self-esteem andconfidence as well as vocational skills. What is it like to work with the apprentices in the SYNTRA classrooms? Dirk Aerts: I studied for my teacher s diploma in the evenings, besides working. There is a great difference working with young people in the SYNTRA classrooms than a traditional school class. The atmosphere is different to start with; the apprentices are all colleagues together, because they are all out at work four days a week. An additional challenge is that the young people have come from all sorts of different educational backgrounds, and are at different academic levels. The Trainer s role is to create the environment that encourage young people to learn from each other, to challenge and question, to think about how they would solve a particular real-life problem and to think outside the box. During the time the apprentices are in the classroom Trainers ask what they are doing on the job, and invite them to share good and bad experiences in the workplace. In this way different ideas come and the test results reflect that through this collaborative, selfdevelopmental learning approach and the cross-fertilization of ideas the young people remember more. This is key to the ethos of SYNTRA Flanders Trainers; that they are able to create this kind of environment, that they are not bound by strict guidelines, and that there is more freedom in which pedagogical approach to take. It is a different way of getting to the same end outcome; and it appeals well to the apprentices in the classroom. 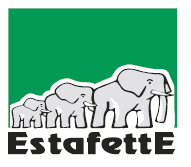 6 Can you tell me a little bit about the Estafette Mentoring Programme for people wanting to work as a Mentor with one of the apprentices? Dirk Smet: Working as a Mentor is stimulating; the apprentice has the opportunity to learn a lot and learn fast; not only vocational skills, but what it is like to work as part of a team, and work to deadlines delivering what customers want. As Mentors we work with the apprentices on a daily basis in the workplace. Some of the apprentices are not so engaged with the classroom element, but we encourage them, as this is an opportunity to get their educational qualifications as well as the work experience. Dirk Aerts: I also deliver the Estafette Programme, which is obligatory (but free) for all new SYNTRA Mentors. The Programme lasts twelve hours and focusses on how the mentor can optimize the start of a new and especially young colleague in his company, and on guidelines to manage, motivate, coach and evaluate properly. It is an investment in your competencies as Mentor: providing professional training, coaching, mentoring and working together. Gen e Tutors. Passionate about teaching? We are too. Apprenticeships Everything you need to know about an Apprenticeship with West Sussex County Council West Sussex County Council Apprenticeships:? There are over 240 types of apprenticeships you can do. Interview Skills. The top 10 interview questions and how to handle them confidently. So, tell me about yourself. Employment for people with disabilities. Plan to improve how people with disabilities in Northern Ireland get a job. To reach their highest level of performance, employees need coaching which requires focus and consistency, as well as specific skills. That was the business side of Doc, but there was another side of him as well. Unit Five Who Wants to be an Entrepreneur?